The classic unison sound, produced by mixing a large number of detuned sawtooth waveforms, is a defining element of many forms of electronic music. Genres such as trance owe much of their identity to this fat (or indeed, 'phat') sound. Its popularity can be traced to the supersaw waveforms of 1990's hardware synths, the Novation Supernova, or the Roland JP-8000. But its roots extend further back, to 1980's analogue hardware like the Roland Juno 106 or the Sequential Circuits Prophet 5. In the case of the Prophet 5, we have a five voice polyphonic instrument, with each voice having two oscillators. By sacrificing polyphony and turning on unison mode, all ten oscillators could be detuned and dedicated to a single voice. This tutorial covers the basics of unison mode in Aspect. Aspect is available for Mac OS X, Windows, and Linux in Audio Unit, VST Plugin, and Standalone formats. Download the Aspect evaluation here. The evaluation version is all that is required for following the tutorial. However, only registered users will be able to open the example patches accompanying this article. Aspect's Unison control is at the bottom right of the Aspect interface, next to the Polyphony control. This is no coincidence: unison is closely related to polyphony. With Unison set to '1 (Off)', Aspect acts a traditional polyphonic instrument. Each note played uses one voice of polyphony. Increasing the value of the Unison control increases the number of voices in a note. For example, setting Unison to '2' means that each note played will result in using two polyphonic voices. Stacking voices is only useful when each voice is different. Five voices, all producing exactly the same sound, simply sounds like a louder version of one voice. The key to a powerful or interesting unison sound is in the differences between each voice. In Aspect, this variation comes from using the UnisonDepth modulation source to give each voice its own sound. The first unison sound we will create is perhaps the most recognizable, and certainly the simplest: the supersaw. As you will recall from the introduction, the supersaw is created by stacking a large numbers of detuned sawtooth oscillators. In order to detune each voice, we now need to assign the UnisonDepth modulation to the Oscillator pitch. The first modulation slot has been assigned to Note Pitch, so we'll move onto the second. Click on Oscillator 1's second modulation slot (the white button in the middle that says 'Off', slightly below and to the right of the Detune control). Then click on the combo box above the button, and select 'UnisonDepth' from the modulation source list. Now, whilst playing a note, increase the modulation depth by turning the rotary control. Notice that as the UnisonDepth increases, the detuning becomes more prominent and the sound becomes fatter. Now let's do the same to Oscillator 2. First of all, ensure that Oscillator 2 is routed into the main mix by turning up the Oscillator 2 control in the Mixer. Feel free to tweak each Oscillator's Octave, Tranpose, and Detune controls until you find a suitably big sound. Download the Supersaw patch here. Set the Pan control in the Output section all the way to the left. Route the UnisonDepth modulation source to the first Pan modulation slot. Second voice, 25%, halfway between the far left and middle. Fourth voice, 75%, halfway between the far right and middle. Download the Panned Supersaw patch here. Detuning each voice by a small amount, such as few cents, gives the impression of one fat sounding note. But rather than detuning oscillators by small amounts, we can also detune by much larger values. Detuning by semitones, for example, can create chords from single notes. Start with a new, empty, program ( File / New Program). Set the Unison to 2 and Polyphony to 12. Route Oscillator 2 into the mix by increasing the Mixer / Oscillator 2 control. Transpose Oscillator 2 by 3 semitones. 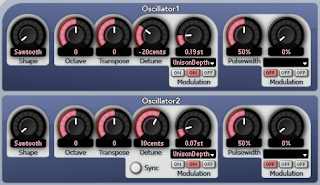 With Oscillator 1, select UnisonDepth as the second modulation source and increase the depth to 7.00 semitones. Note that any rotary control can be finely tuned by holding down shift whilst dragging it. With Oscillator 2, select UnisonDepth as the second modulation source and increase the depth to 7.00 semitones. Download the Unison Chords patch here. Additive Synthesis involves mixing together sine waves of different frequencies to produce complex waveforms. A simple additive instrument to emulate is the drawbar organ - by combining just six sine waves, a convincing Hammond organ sound can be produced. Route Oscillator 2 into the mix by increasing the Mixer / Oscillator 2 control to 100%. Set Oscillator 1's second modulation slot source to UnisonDepth, and set a depth of 12 semitones. Transpose Oscillator 2 down -3 Octaves, and set its second modulation slot source to UnisonDepth, and set a depth of 12 semitones. Download the Sine Organ patch here. The Filter Mix modulation slots allow each voice within a unison note to have different mixes of Filter 1 and Filter 2. In the following example, a two voice unison note is split so that one voice consists of Oscillator 1 routed through Filter 1 and panned hard left. The second voice consists of Oscillator 2 routed through Filter 2 and panned hard right. Download the Filter Mix patch here. Formants are resonant peaks within the spectrum of a sound. It is the formants caused by the mouth, vocal and nasal tracts that gives speech, particularly vowels, their identifying sound. Vowel formants can be approximated by using four parallel bandpass filters. Whilst Aspect may only have two Filters per voice, by using two unison voices per note we get the required four bandpass filters. Download the Formant Filter patch here. Aspect's unique architecture and UnisonDepth modulation source offer practically limitless flexibility. 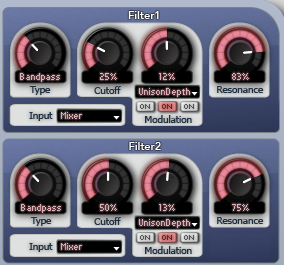 Stacking unison voices is a simple way to extend the limitations of two oscillators and two filters per voice. Variations within each voice is the key to producing interesting unison sounds. It's all clear now, thanks!